Rodrigo Cordero is Associate Professor in Sociology at University Diego Portales, Chile. Society is not a solid crystal, but an organism capable of change, and constantly engaged in a process of change." This quote from the Preface to Capital signifies not only a cornerstone of sociology but is more actual than ever. Society, and this is the brilliantly explained throughout Cordero’s book, appears as a solid crystal once critique is isolated from crisis and crisis from critique. Cordero’s fascinating and well written book forces the petrified oppositions between paradigms of discourse analysis (Foucault) and political action theory (Arendt), of societal (Habermas) and conceptual (Koselleck) theories of modern society to dance by singing their own tune to them. This opens the path to a new, and much stronger theoretical combine that reveals new paths to utopia within the existing relations of power and production. The solidity of the crystal consisted in frozen concepts. It needs a categorical spring to make them melt. This book is spring-time for the return of social theory. Hauke Brunkhorst, Professor of Sociology at the University of Flensburg, Germany. He is author of Solidarity: From Civic Friendship to a Global Legal Community and Critical Theory of Legal Revolutions. When a person is in crisis, she goes to see a psychoanalyst. When society is in crisis, sociology emerges as a psychoanalysis on a grand scale. And when critique enters into crisis, one turns to Rodrigo Cordero. 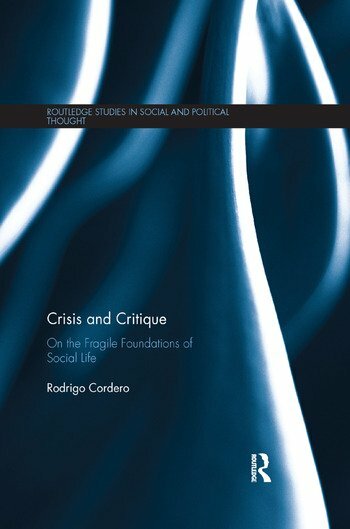 Not that one will find a way out of the crisis, but following a rich investigation of the relation between critique and crisis in social theory, from Marx to Habermas and Arendt to Foucault, one will rediscover the human frailty in the cracks of society and our responsibility to respond to it. Frederic Vandenberghe, Professor in Sociology at the Institute of Social and Political Studies, Rio de Janeiro State University. Author of A Philosophical History of German Sociology. Rodrigo Cordero has done a magnificent job in shedding light on the pivotal role that both crisis and critique play in the tension-laden construction of human reality. This book is a powerful reminder of the profound fragility that permeates the whole of social life, including its seemingly most solidified dimensions. I have never come across a more persuasive account of the multiple ways in which the dynamic relationship between the experience of crisis and the practice of critique defines – and, indeed, constantly redefines – the normative parameters for what it means to be human. Simon Susen, City University London. Author of The ‘Postmodern Turn’ in the Social Sciences and The Foundations of the Social: Between Critical Theory and Reflexive Sociology.